This section will feature photographs, artworks, and writings accumulated from years of travel. For now, most are lost, misplaced, or forgotten in dozens of shoeboxes and manila folders, those keepers of our past. I will post them as they are found, but only if i think they will not burden you like the guest forced into the after-dinner viewing of travel photos or videos, struggling with boredom and embarassing somnolence. Someday, I hope to put it together. All those photos and sketches, half-remembered, half-forgotten. A castle, a mountain, a river, a face. Somewhere, sometime, someone. But there are some travels we so easily talk about; and one that we would risk the boredom of the listener. For me it was a maddenning cross- country odyssey across the USA, from baltimore and back, camping the National Parks, 11,120 miles in 20 days, alone, saturating in wonderment at the unending unfolding of scenic vistas, not just in the National and State parks, but in-between, the small towns, all those deserted back roads and country roads, the countless breath-taking views that catch you as you screech around the perilous bends. Soon enough, I just gave upon the camera and the cumbersome tasks of filters and lenses and consigned most of the images to memory and the sketchpad. . .And, despite the back-breaking hardship, the constant longing for home-cooked meals, the aloneness in those long stretches of empty roads kept company by the country music whining about lost loves and heartaches, discovering the beauty of this country was the best travel I have made and the travel story I love retelling. Also, my travels are punctuated with litle stories that come from being a physician, inevitably digging into and dispensing from the black bag of medicines, hoping to salvage trips for those so often disabled by the ills and ailments of travel. . . 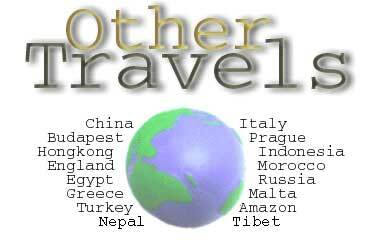 The section will provide links for travel and advice for travel places I am familiar with. For queries, email:Godofredo Stuart.